After getting a look at the decor heights of our lovely bedroom, I thought I’d show you the disaster that is our bathroom. I will admit…. we chose that blue. I was 22 and inexperienced, and I have learned a lot since then. But anyway, some natural aging on the house means I get to make over our awkward first paint and decor choices! There are tiles peeling off over the tub, so an overhaul on this bathroom is on the must-do list. I’m quite sure it will be easier and much cheaper than the never-ending kitchen project! Walking in from the hall. The grodiest shower in the developed world. I can’t even show you a picture of the inside. More grout comes out every time I scrub the tiles, so I’m never sure how hard I should work to get it clean. 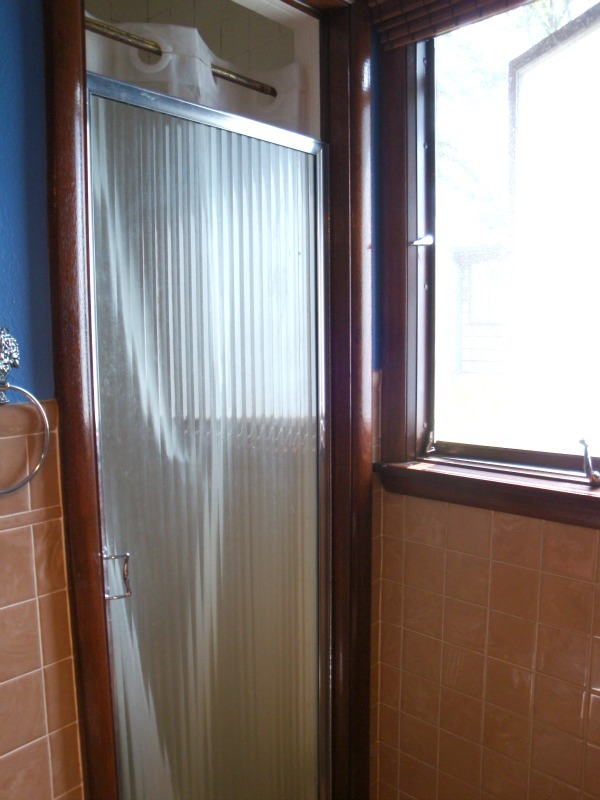 Someone brilliantly put wood trim around the shower door, so we have to be very careful about wiping it off after showers. The sink is… very special. 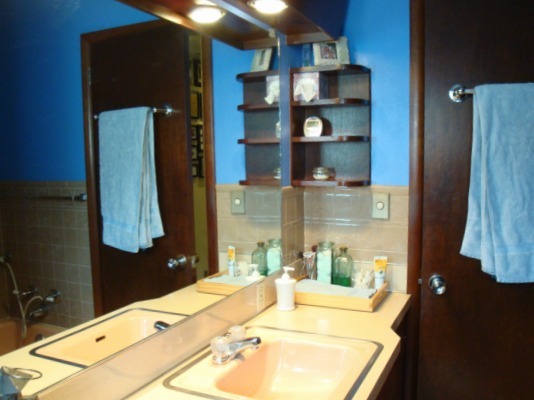 Also, the vanity is humongous and takes up half the bathroom. They had to make a cut-out so the door would swing open. This bathtub is also special. The shower extension doesn’t go high enough for a shower. And those fake brown tiles are peeling off! 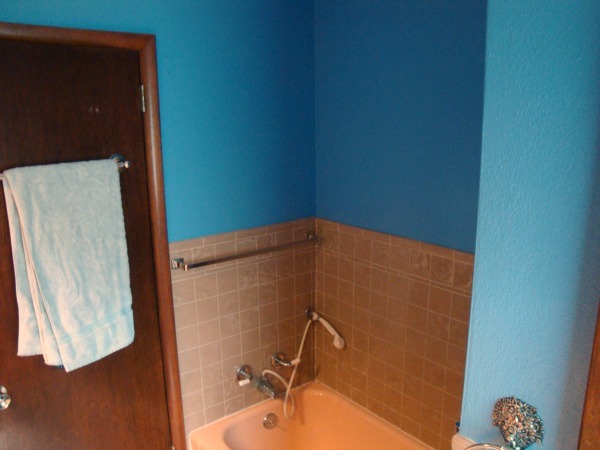 I don’t really know when this will happen, but plans for the bathroom include: retiling the bathtub surround and putting in a shower head; turning the yucky shower stall into a linen closet; replacing the toilet; replacing the vanity with something skinnier; and repainting the walls gray. I think deep-down, I would be more adventurous with color for the rest of the house, but Aaron likes to keep things very neutral since we will need to sell the house in a few years. I’ve heard that restrictions on creativity can actually be a freeing thing, and I think it’s true for how we’re putting the house together. By working to find things we both like, I think our house has a pretty clearly defined aesthetic that neither one of us would have found on our own. (Aaron actually cares about this quite a bit, which surprised me, but I bet if he was on his own it wouldn’t be a high priority.) 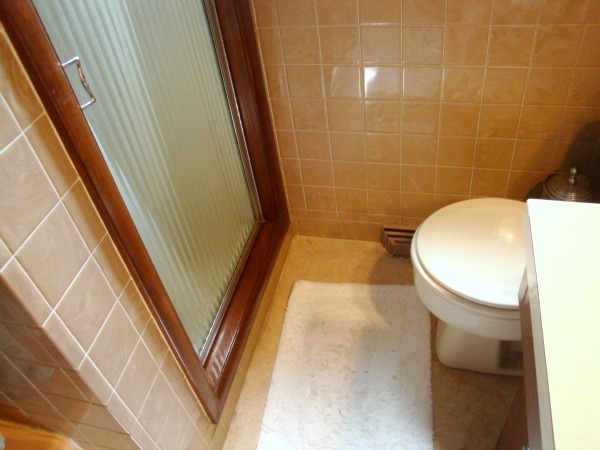 This co-decorating sense makes it a little easier to pull together new projects, like our bathroom. 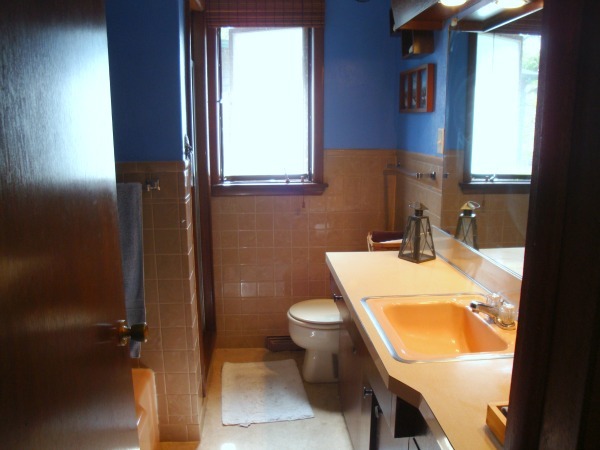 I like this first inspiration bathroom better because it feels a little more “grounded” with those black shelves. But no matter how it works out, I keep coming back to the gray-with-rustic-wood combo whenever I look for ideas, so I’m pretty sure we’re going for something like this! My favorite inspiration bathroom! From Focal Point on my Pinterest boards. More natural wood with gray! From a YHL Reader Re-design, on my Pinterest boards.